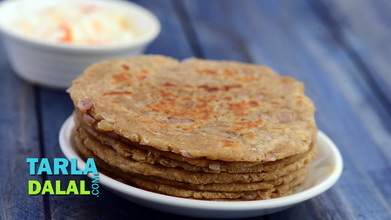 These parathas has a high nutritional value as whole wheat flour and baby corn are both good sources of energy and proteins. 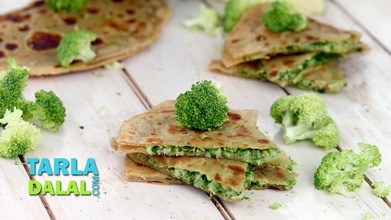 In addition, spinach adds to the wealth of their iron, folic acid and vitamin a content. 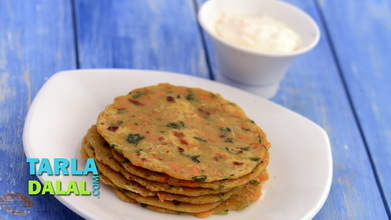 These nutritious parathas are ideal to be packed in your kid's lunch box. 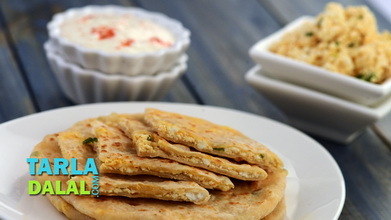 They can also be served at parties with spicy pickles like garlic pickle or with a sweet and spicy vegetable pickle. Combine all the ingredients, mix well and knead into a soft dough using enough water. Allow the dough to rest for at least 30 minutes. Keep aside. Heat the oil in a broad non-stick pan, add the baby corn and sauté on a medium flame for 2 to 3 minutes. Add the green chillies, spinach and salt, mix well and cook on a medium flame for 1 to 2 minutes, while stirring continuously. Divide the stuffing into 3 equal portions and keep aside. Divide the dough into 3 equal portions and roll out one portion of the dough into a circle of 150 mm. (6”) diameter circle. 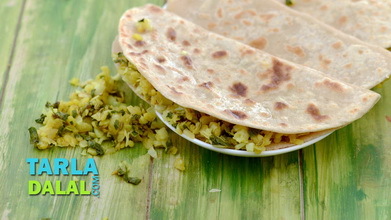 Put 1 portion of the filling on one half of the roti and fold it over to make a semi-circle. 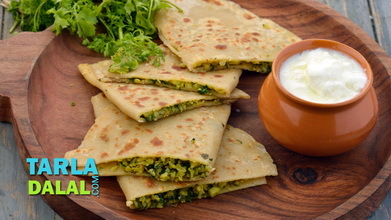 Heat a non-stick tava (griddle) and cook the parathas on a medium flame for 3 to 4 minutes, using a little oil, till it turns golden brown in colour from both the sides. Repeat steps 2 and 3 with the remaining dough and filling to make 2 more parathas. Serve immediately with pickle. .